This is my second article on a series of posts documenting the rebuilding of the LAN at my home and is a copy of an article I had originally posted on LinkedIn. The original article is here. This post is about the design of the different networks I’m putting in place to connect all my devices, and maintaining security of my personal data. One of the things I want to do right this time around is to establish a clear separation between Internet-only traffic (strictly from a device to the Internet without interacting with other devices in the LAN) and traffic to services running in the local network. An example of the first type of traffic would be video streaming or gaming, whereas the second type could be printing a document or accessing the local file server. This doesn’t mean that the internet-only, or “external” LAN should be completely isolated: some services will be accessible, but the devices in the external LAN should not have carte blanche to connect to every service or computer they want. As for wireless access, guests will be able to connect to the external LAN through WPA2 Personal authentication, and wireless clients for the internal LAN will use username/password authentication on a different WPA2 Enterprise network. All user accounts will be kept in the server, in an LDAP server that all services will use (I’ll discuss this in a future post). And since I’m building this network trying to manage risk as much as possible within budget, I’d also like to put all management services (like SSH servers and web configurators) in a third VLAN, that would only be accessible through a limited set of connection points. 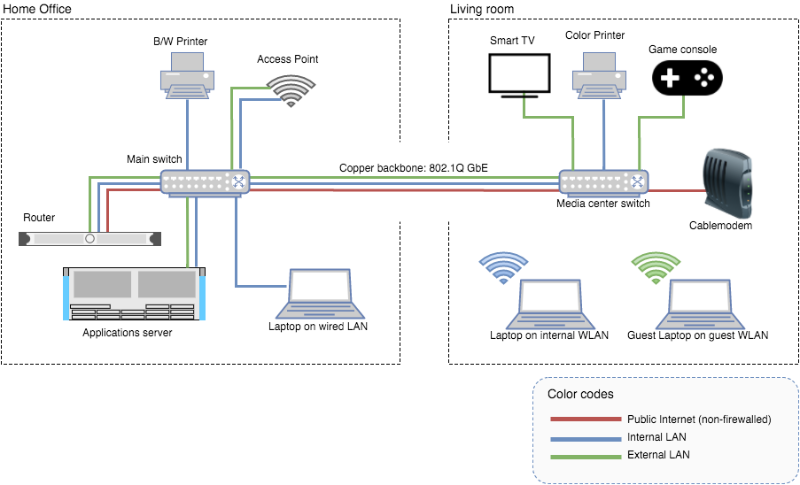 My only problem is that the layout of my house forces me to have the Internet connection in my living room, away from the home office that will house the router and the applications server, and connected to a second switch that I will install in the living room. So the Internet connection that under normal circumstances would use a dedicated cable to the router will in my case be a VLAN sharing the same gigabit link as the rest of the VLANs which will force me to be very careful when configuring the switches. It’s not ideal but it will have to do. IPv6: (Preffix assigned by ISP)/60 + subnet 2. We have come a long way since the days of dial-up modems and bandwidths of just tens of kilobits per second. Nowadays cable modem speeds go up to tens (sometimes hundreds) of megabits per second and gigabit fiber-to-the-home is starting to become a global standard. That would be enough if traffic demands had not grown exponentially as well, sometimes even faster than the technologies that support them. Streaming media: non-real-time, bounded speed (usually by resolution or quality of the media). VoIP: real-time, highly sensitive to latency, low or medium bandwidth. Video conference: same as VoIP but with higher bandwidth requirements, for both download and upload. Internet data: web pages and IM; high bandwidth requirements for short amounts of time, medium sensitivity to latency. Bulk data: mostly large file transfers. Low sensitivity to latency. Bandwidth for at least one Skype video call, to call our families on the weekends. These calls should have minimal delay (ideally, they should have zero delay). Microsoft recommends 500Kbps up/down for high-quality Skype calls. The packet classifier must allow for at least this much traffic using a real-time scheduling policy. Minimal delay for interactive SSH sessions, but SFTP transfers’ bandwidth should be limited. Traffic on port 22 should have high priority (but not higher than VoIP) if it’s less than 100Kbps. Anything higher than that (most likely an SFTP transfer) should be fair game. Guaranteed bandwidth for streaming video, enough for at least 720p resolution, so that large file transfers don’t prevent other people from watching TV. A 720p HD video stream is about 4 to 5 Mbps depending on who you ask. I’d like to guarantee 5mbps for Netflix and Amazon video, and let everything above that (1080p and above) be fair game. Dynamic bandwidth for off-site backups: Up to 95% of uplink speed during the night, up to 50% during the day. Everything else would share the same QoS level and compete for bandwidth as usual.